The sensing and measurement of physical quantities through small changes in electrical capacitance is scarcely a new concept. The natural benefits of this approach were recognized for many years. But it was not until Setra engineers introduced new materials, new designs, and innovative, dedicated circuitry that the techniques full potential was realized in the practical, real world of pressure measurement. 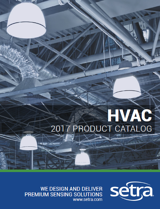 Today, capacitive pressure transducers are widely used in both highly-specialized and general equipment applications that call for thoroughly dependable accuracy and/or long-term stability. They are especially in demand wherever a job involves adverse operating conditions, such as shock, vibration, temperature extremes, etc.Designers and engineers find that the electrical simplicity and inherently rugged mechanical structure of the typical capacitive sensor result in relative freedom from the problems to which more glamorous technique are usually susceptible. applicability to pressure measurement problems that call for more than offhand solutions. 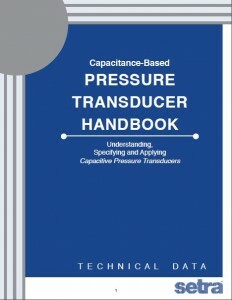 CLICK HERE to download Setra's Pressure Transducer Handbook to learn more!